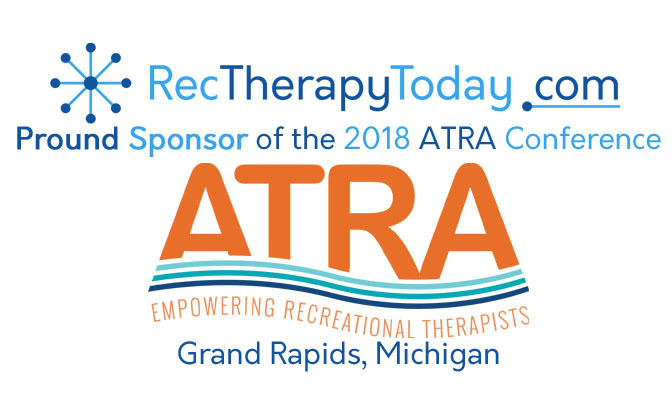 Rec Therapy Today is definitely proud to announce its presence at the 2018 American Therapeutic Recreation Association (ATRA) annual conference. This year’s conference will be held at the Amway Grand Plaza Hotel in Grand Rapids, Michigan from September 13th through September 16th. Attendees at this conference will receive a Rec Therapy Today notepad and ink pen. These items will be useful for taking notes and getting names and numbers from other Recreational Therapists so you can keep in touch. The founder of Rec Therapy Today, Danny Pettry will be in attendance on Fri. September 13th and Sat. September 14th. Danny Pettry is a Lifetime Member of ATRA. Pettry has previously won the 2004, ATRA Peg Connolly Student Scholarship (Kansas City, Missouri) and the 2005 Recreational Therapy Advocate of the Year Award (Washington, DC). Pettry has previously served on the Peg Connolly Scholarship Selection Committee (2009) and the Recreational Therapy Month Committee (2013-2014). Pettry has served on the ATRA Public Policy committee since 2014. ATRA is the only national membership organization representing the interests and needs of recreational therapists. ATRA’s Mission is to empower the more than 10,000 recreational therapists that connect through ATRA as members or recipients of ATRA services and resources. For more information about ATRA, go here: https://www.atra-online.com. ATRA and logo are trademarks of ATRA.